Is the Staffordshire Bull Terrier right for you? Find your perfect match now! You might not expect a dog originally bred for fighting to be so wonderful with kids, but the Staffordshire Bull Terrier really is. Known to their fans as “Staffords” and “Staffies,” this breed is known to Brits as the Nanny Dog, for her gentle, loving manner toward children. While all dogs should be supervised with children and every dog is an individual, this breed is often eager to assume the role of nursemaid and loves her family deeply. Unfortunately, this breed has become a target of breed-specific legislation in some areas and acquiring home insurance may be more expensive for their families. Originally from England, this medium-sized and medium-energy breed can grow to between 24-38 pounds and lives an average of 12-14 years. The breed is recognized by the American Kennel Club and classified as a member of the Terrier group. WHAT IS A STAFFORDSHIRE BULL TERRIER'S PERSONALITY LIKE? Tenacious and stubborn, Staffords can be a bit…well, bullheaded. But they're also clever, playful, and surprisingly gentle with people — especially where children are involved. When properly stimulated and exercised, Staffordshire Bull Terriers make quite, trustworthy, reliable canine companions to their chosen people. However, not so much with other dogs. This dog prefers to be your only canine companion. This breed has a well-developed comedic sense and a bottomless well of courage. WHAT IS STAFFORDSHIRE BULL TERRIER BEHAVIOR LIKE? 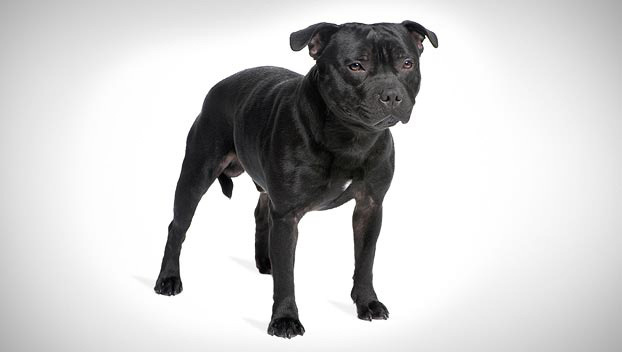 Powerfully built, strong, and agile, Staffordshire Bull Terriers are rock-solid dogs. This somewhat active breed needs space to run and lots of exercise in a well-fenced area every day, or she will make her own fun. (Warning: her fun might start with your shoe closet or the arm of the sofa.) Staffords have powerful jaws and they like to chew, so keep plenty of sturdy, safe chew toys around. They also enjoy roughhousing and tugging games. Given this dog's physical strength, working with a trainer to establish appropriate play methods early on is a good idea. HOW EASY IS IT TO TRAIN A STAFFORDSHIRE BULL TERRIER? Intelligent and independent, Staffordshire Bull Terriers are going to make you work for it. Be patient and consistent when training this sweet and strong-willed dog. Because they're prone to chasing small furry creatures and not often friendly to strange dogs, you'll probably want to avoid off-leash play and dog parks with your Stafford. 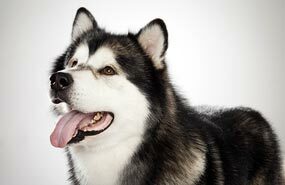 This breed often enjoys dog sports like agility and obedience. HOW MUCH DO STAFFORDSHIRE BULL TERRIERS SHED AND WHAT ARE THEIR GROOMING NEEDS? Easy peasy, these smooth-coated terriers don't require much grooming. A quick weekly brushing will get the job done. Staffordshire Bull Terriers are seasonal shedders. Bathe as needed. WHAT HEALTH PROBLEMS DO STAFFORDSHIRE BULL TERRIERS HAVE? As a breed, Staffordshire Bull Terriers are generally healthy. Some are prone to eye ailments, palate malformations, deafness, immune system disorders, and mild dysplasia. ARE STAFFORDSHIRE BULL TERRIERS GOOD FOR PEOPLE WITH ALLERGIES? The American Kennel Club doesn't list Staffordshire Bull Terriers among its breeds recommended for allergy sufferers. WHAT IS A STAFFORDSHIRE BULL TERRIER'S BEST DAY? Staffordshire Bull Terriers look tough, but they are big piles of vibrating love with their chosen people. Supervise your Stafford as she runs about in a well-fenced area with “her” people, sniff, explore, and chase any squirrel dumb enough to wander into the yard. You know, terrier stuff. Finish off the day with some training exercises to make her work for her dinner. SHOULD I ADOPT A STAFFORDSHIRE BULL TERRIER? Staffordshire Bull Terriers are prone to overheating and should be discouraged from rigorous play in hot weather. They also don't do well in particularly cold climates. Staffords are sometimes the target of breed-specific legislation, so be sure you're legally allowed to own one before you start the adoption process. As a Stafford's family, it'll be important that you're willing to be an ambassador for the breed — working with your trainer to keep your pup a model canine citizen and breaking down breed stereotypes. With enough training and attention, a Staffordshire Bull Terrier could be an ideal companion for your single-dog household. Have you decided that a Staffordshire Bull Terrier is the perfect dog for you? Why not be your new best friend's hero and adopt a rescue! Be sure to check out our article on what to expect when you're adopting a dog or cat.